We had a great time on this tour. The guide did a good job of educating us on the area and it was very interesting seeing the ghats from the river in the morning. We also did an evening tour with the same company and the contrast between morning and evening was very neat to see. There was a temple/mosque that we tried to see, but were unable as we didn't bring our passports. You may wish to ask your guide about this before starting the day as well, so you are properly prepared. 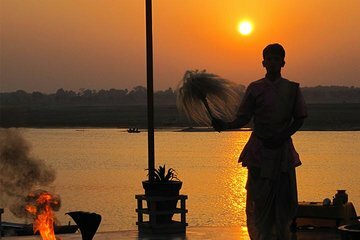 As a first time visitor to Varanasi, I would recommend this tour to others as well. Absolutely amazing. Tour guide was very professional and knowledgeable. Very relaxing tour, at no time did we feel rushed. Would highly recommend this to anyone. We had a private SUNSET TOUR.The communication on the run up to the trip was amazing. We met our Guide Saban. His English was fantastic and he was very informative and got us great seats for the ceremony afterwards. The Aarti Boat trip is not to be missed when in Varanasi. Highly recommended! Expensive, only one hour on the boat, enjoyed the experience though, guide very pleasant ane great being picked up from the hotel. Great way to get a fell of Varanasi,very knowledgable guide and great rower ,imagine rowing us for 45 min approx.we enjoyed this ride so much that we also did it at night time to see the ceremonies. Great tour. Informative friendly guide. We loved it.